IGP demotes, transfers DPO for assaulting female traffic warden - BlogIT with OLIVIA!!! THE Inspector General of Police (IGP), Solomon Arase, has ordered the demotionin rank of the Divisional Police Of­ficer (DPO), in charge of Ikenne Division of Ogun State, Mr. Patrick Onwu, for assaulting a female traffic warden. Also, the IGP, has ordered the immediate transfer of the alleged bully officer from Ogun state police command, even as he has ordered the Commissioner of Police to set up an investigative panel on the matter and report to the force headquarters. The IGP directed the state commissioner to forward the necessary details of the accused officer to the force secre­tary, Abuja for further disciplinary actions.Onwu, has now been demoted to the rank of Deputy Superintendent of Police(DSP) from Superintendent of Police(SP).The former DPO, was said to have beaten up a female traf­fic warden, Inspector Anifat Bello, at her duty post at the Nigerian National Petroleum Company (NNPC), junction, on IBB Boulevard way, Abeokuta, the Ogun State capital. 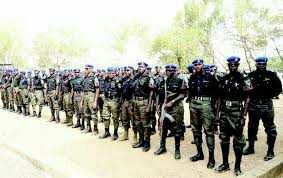 Daily Sun, gathered that the IGP, who got to know about the incident on the pages of newspapers, was said to have immediately put a call to the State Police Commissioner and gave him the directives.Top police sources told Daily Sun, in Abuja, that the force headquarters was monitoring the IGP’s directives to ensure strict compliance. Police sources also said Arase, commended the high level of discipline displayed by the female traffic warden who he said refused to fight back, saying the likes of Patrick Onwu, should not be in the police.